By the time you realize the fact that you have turned into an adult, you will notice that everything around you has also changed: the environment in which you spend your everyday life, the people you interact with, and maybe even your inner-self. However, among all the changes around you, there is something that never changes, which is “friendship”. 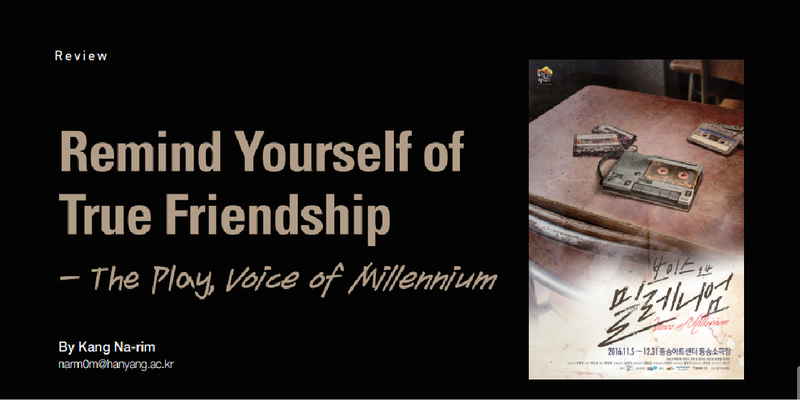 The play, Voice of Millennium, with its touching story of four friends, gives us a chance to go back to our precious school days and recall memories of the past in which friendship was what made us laugh with joy and sometimes cry in sorrow. The first scene takes place in 2016, where Ji-hoon is lying in a hospital bed. He has been in a vegetative state for 16 years after a mysterious car accident, and everybody seems to have given up on him. His old friend Myeong-gu, a shabbily dressed young man comes into the hospital room and sits next to him. In a drunken state, Myeong-gu talks about how he found the old voice recorder in which they used to record their daily lives. As he puts the recorder in Ji-hoon’s hand, a miracle happens and Ji-hoon wakes up. The scene changes to the night of December 31, 1999. The four friends, Ji-hoon, Hyeong-suk, Myeong-gu, and Dong-wu, who were high school freshmen at the time, wait for the New Year’s countdown in Jeongdongjin. They start to record their memories in a voice recorder and promise each other true eternal friendship. Although the four friends were from different family backgrounds, had different dreams, and had different personalities, none of these differences mattered to them as they were friends. They liked each other for who they were, and made new memories together every time they met. The movie comes back to 2016. Unlike their delightful past, the atmosphere of the hospital room with Ji-hoon, Myeong-gu, and Dong-wu is awkward. Unlike Myeonggu, who is shabbily dressed, Dong-wu is wearing a luxurious suit. Dong-wu informs Ji-hoon of the fact that 16 years have passed, and that he has become a doctor. Jihoon, with his tone full of amazement, asks how he became a doctor when he used to be at the bottom of their class in high school. The audience laughs at this point when Jihoon comments about the unbelievable changes of his old friend. Ji-hoon longingly waits for Hyeong-suk, who is the only one that has not arrived yet. Standing away from the two friends, Myeong-gu seems to have a perplexed look. Noticing this, Dong-wu calls him out for a short talk. Myeong-gu seemed to be even more so when Dong-wu said, “Let’s pretend like nothing happened between us, like we are still friends. I have to study Ji-hoon for my new thesis on vegetative states.” Dong-wu brings Ji-hoon a contract and requests him to sign it. In the past, Dong-wu believed that money was the most useless thing in the world, but now all he cares about is money and his reputation as a doctor. The movie shifts back to the year 2000. Nothing has changed, but some events started to cast a shadow on their friendship. In the case of Myeong-gu and Dong-wu, the two were especially close to each other, however, their lives were totally different. Myeong-gu lived with his alcoholic father, and struggled working part-time jobs in order to make ends meet. He was the type of student who was too poor to study, even though he wanted to. On the other hand, Dong-wu’s parents were doctors and always provided him with the opportunity to learn from the best tutors. He, however, refused to study and always hung around with Myeong-gu at his side of town. He was unwittingly hurting Myeong-gu’s selfesteem and making him suffer from an inferiority complex. Ji-hoon and Hyeong-suk’s problem was different from theirs. Hyeong-suk had a crush on Ji-hoon’s girlfriend, Jin. He fails to talk to Ji-hoon about his true feelings for Jin, and secretly goes through an inner conflict between friendship and love. His final decision heavily affects the entire friendship between the four, completely changing their fate. Their friendship was consciously and unconsciously falling through a crack and eventually they ended up hurting each other. Back in 2016, Hyeongsuk arrives at the hospital. The four have gathered together, but everybody has changed too much to feel the intimacy and vitality of the past, when they were high school students. Ji-hoon notices this change and suggests going to Jeongdongjin, the place where they first started recording their memories. At this point, the play concentrates on finding out the secret of Jihoon’s accident, why the other three friends suddenly became so uncomfortable, and how the four will overcome this problem. The unexpected plot reversals surprise and touch the audience. Repeatedly moving from the past to the present, the play gives us a chance to recall our own school years and think about the true meaning of friendship. School day memories are what people state they would like to go back to the most. They say the school uniforms, the classrooms in which they used to study, and the old teachers are all something they would like to experience once again. These memories are precious because we have no chance of going back. However, among all of these reasons, the most important feature that makes school day memories especially special, is our friends. Although everybody uses the same phrase, “school day memories”, each and every memory is special because they are made up of unique friendships and feelings. The tvN dramas Reply 1997 and Reply 1988 were massively popular for nostalgic reasons. Both shows recreated school day memories of people who were now adults. As society requires modern people to live busier lives, the trend of dramas, plays, and movies that reminisce about the past keeps receiving more and more attention. The play, Voice of Millennium has a similar theme. It provides modern day people an opportunity to recall priceless memories of their school days and appreciate their valuable friends. In this society where everything changes rapidly and everybody works busily, what people are most likely to forget is the priceless value of the people around them. Voice of Millennium, the play which allows us to laugh and cry while watching it, and which warms our hearts after it is finished, is the best play to see to close out the year.